Begonias are wonderful for adding tons of color to a shade garden, or combined in a mixed planter, and they are commonly sold as annual plants in cold climates. But begonias are actually tender tropical perennials that can easily be brought indoors and grown as houseplants, and many of them bloom year round. Indoor begonia plant care isn’t difficult, and you’ll find that they require similar care as other common houseplants you’re probably already growing. There are literally thousands of different types of begonias, and they come in a wide variety of shapes, sizes and colors. Some begonias are adored for their gorgeous flowers, and others for their amazing foliage colors and patterns. 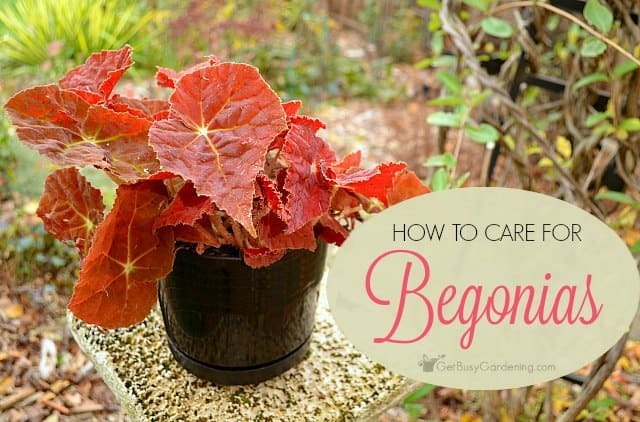 They don’t all require the exact same care, so it’s best to figure out what type of begonia you have so you know if it has any special needs. Some of the most common types of begonias you’ll find for sale at garden centers are tuberous begonias, wax begonias, rex begonias, stemmed begonias, cane begonias and rhizomatous begonias (that’s a mouthful!). Tuberous begonias are the only ones that can’t be kept as houseplants, they prefer to go dormant during the winter. But most other types of begonias make great houseplants! 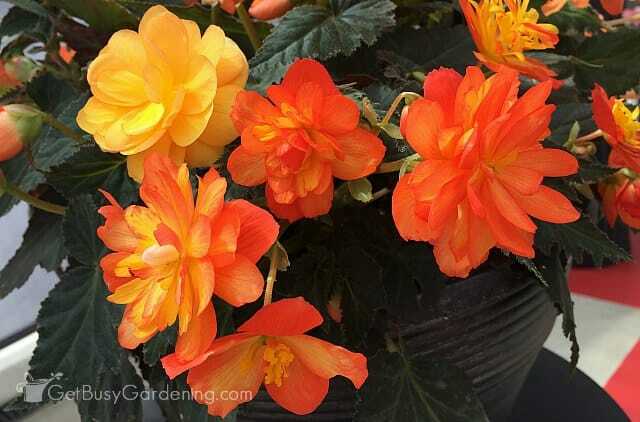 Learn how to overwinter tuberous begonias here. 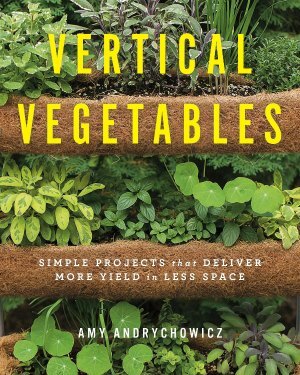 You can move your plants outside during the summer to give them a boost, or you can keep them growing as houseplants year round. If you decide to grow your potted begonias outside for the summer, make sure you bring it back indoors before the temps get too cold. Begonias are not frost hardy, and they will die at the first frost. It’s best to bring them back inside before the temperature gets below 60F in the fall. They don’t like to be cold, and the shock of being moved inside after it gets cold in the fall might be too much for them to survive. Bring them indoors at the right time, and they will thrive as houseplants. Keep reading for more detailed begonia plant care tips. Caring for begonias in pots can be a bit of a challenge because they are very sensitive to being overwatered. In fact, I’m willing to bet that overwatering is the number one killer of begonia houseplants. Take care to only water them when they need it, and allow the soil to dry out a bit between waterings. Stick your finger about an inch into the soil to check it before you add any water, and only water your begonia plant if the soil feels dry. If you struggle with overwatering houseplants, then I recommend getting a soil moisture gauge to help you out. Also be careful of how you water your plants, begonias don’t like getting their leaves and stems wet. They’re not as sensitive to it as African violets and cyclamen plants are, but indoor begonia plants are at greater risk for fungal problems and rot if their leaves get wet. To avoid any issues, you should water begonias from the bottom rather than from the top. Simply fill the plant tray or cache pot with water, and allow the plant to soak it up through the holes in the bottom of the pot. Don’t allow your plants to sit in water for too long though, only to the point where the soil is moist again. Then you can dump out any water that hasn’t been absorbed. Growing begonias in African violet pots is a great way to make bottom watering easy, and it will also help prevent overwatering. Like most tropical plants, begonias like a lot of humidity. Giving begonia houseplants enough humidity can be the hardest part of begonia plant care indoors. Humidity is especially important during the winter months, since heating our homes makes the air even dryer than normal. There are several things you can do to help increase the humidity to a level that will make your begonias happy. Try running a humidifier near your begonias, or put your plant on a pebble tray filled with water (don’t allow the plant to sit in the water though). You could even grow small begonia plants in a decorative plant cloche, or keep all of your plants in a mini indoor greenhouse for the winter. Also, be sure to get yourself an indoor humidity monitor so that you can keep an eye on it, and add more humidity if you need to. Some begonias need more light than others, but in general you should grow your begonia houseplant in a spot where it gets bright, indirect light. An east or west facing window will be the perfect spot for growing most begonias indoors. Many types of begonias will suffer if they get too much sun, and direct sunlight can burn their tender leaves. If this happens, move your plant out of the direct sunlight. 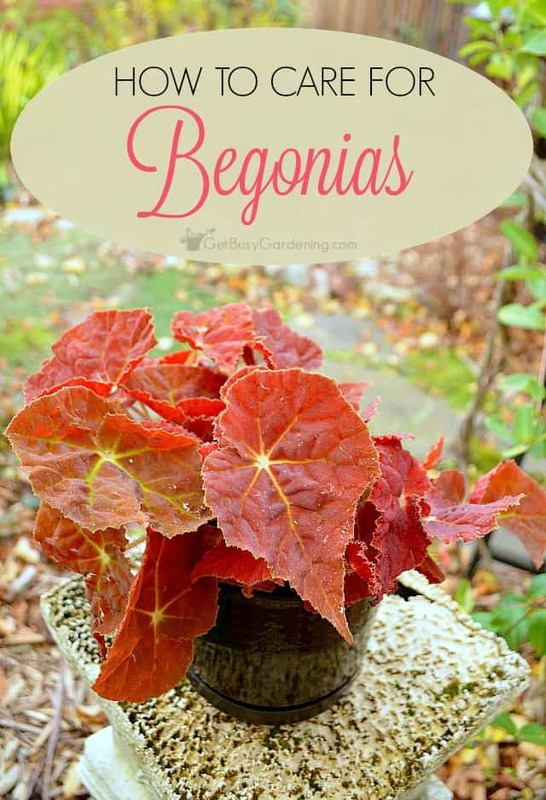 Other types of begonias will start to grow leggy and reach for the window if they’re not getting enough light, or their leaves will lose their color. Move it closer to the window, or add a grow light to help provide enough light for your begonia houseplants. If you move your begonias outside during the summer, make sure to keep them in a shady spot where they’ll be protected from the hot sun. 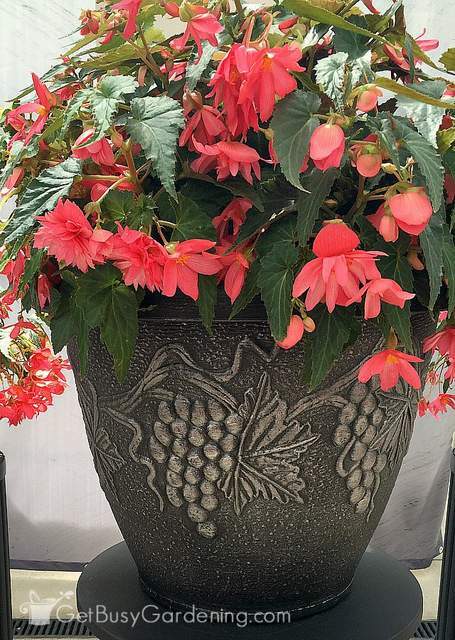 The best time to repot a begonia plant is in the spring, but only repot begonias if they’ve outgrown their container. Begonias like to be pot-bound, and can suffer if they’re planted in a pot that’s too large. When it’s time for repotting begonias, choose a container that is only one size larger than the current pot. 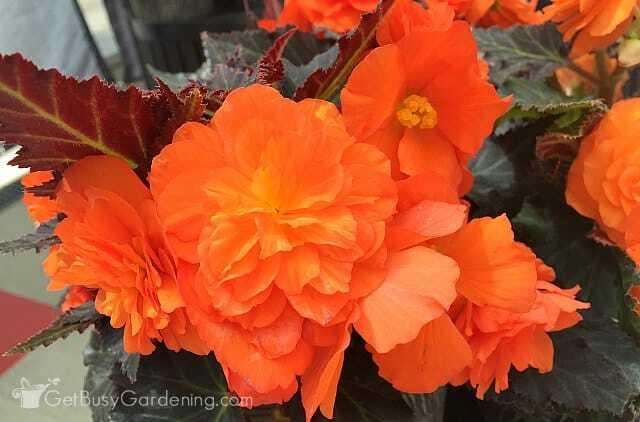 An ideal begonia potting mix would be one that is fast draining, but also holds moisture. You could certainly use general purpose potting soil, and that will usually work just fine for growing begonias. 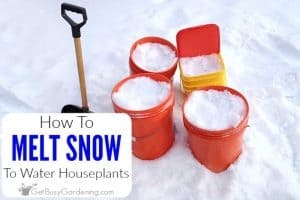 But if you’re worried about over or under watering, then I would recommend mixing some peat moss, vermiculite, and perlite or pumice into the soil. An African violet potting mix would also work well for growing begonias. Begonias will benefit from regular feedings during their active growing season (spring and summer). 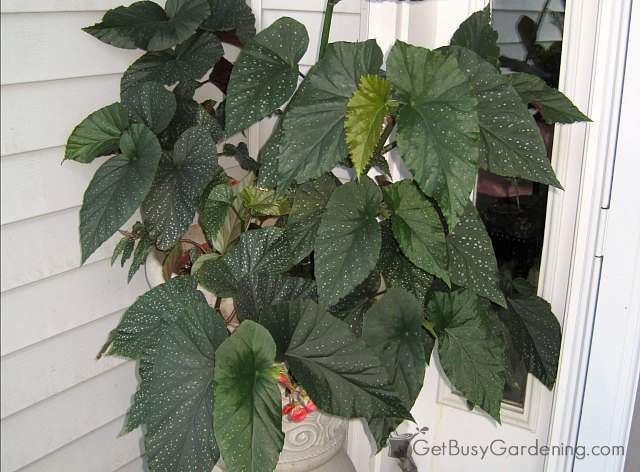 Start by giving your begonia houseplants a weak dose of half or quarter strength liquid fertilizer in early spring. 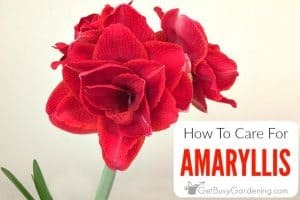 Then gradually increase that so you’re feeding them every couple of weeks as part of your regular begonia plant care routine during the summer. Stop feeding them in the fall, and don’t fertilize your begonias during the winter at all. Potted begonias can be sensitive to chemical fertilizers, so I highly recommend using an organic plant fertilizer on them rather than synthetic ones. A good quality compost fertilizer is always a great choice. You can buy liquid compost fertilizer tea, or buy compost tea bags and brew your own. An organic African violet houseplant fertilizer would also work great for feeding begonias. In general, begonia plants don’t require any special care when it comes to pruning. But pruning begonias on a regular basis is a great way to keep them looking tidy and compact (some begonias can be a bit messy). You can prune off any dead leaves and flowers at any time during the year, and pinching off faded flowers encourages new blooms. If you do decide to prune your begonias, be sure to save healthy cuttings so you can propagate them for new plants! Mature begonias can be propagated by leaf or stem cuttings, by division, or even by collecting and then planting the seeds. Begonia cuttings are pretty easy to root, as long as they get enough humidity. For best results take stem cuttings that are a few inches long, and remove all the flowers and buds. Dip the cut end into rooting hormone, then stick it into a light propagation soil mix (made with peat moss, vermiculite and perlite or pumice). Keep the soil consistently moist, and be sure the air around the cutting stays very humid. I have found that it’s much easier to use a propagation chamber to root begonia cuttings, and I’ve had the best success with that. Collecting and growing begonia seeds is definitely the hardest (and slowest) form of begonia propagation. Begonia seeds are super tiny, and can be a bit difficult to grow, but it’s fun to experiment with it. Another awesome thing that makes begonia plant care indoors even easier is that they don’t usually have much trouble with houseplant pests. Yes! Soil gnats and mealybugs are the biggest risks for begonia houseplants, so keep an eye out for them. Soil gnats are the most common type of houseplant pest, and they can infest any type of plant that’s growing in dirt. They live and bread in moist soil, so if you see tiny black bugs flying around your begonias, it’s a sign that you’re overwatering them. The best way to get rid of soil gnats is to allow your begonia soil to dry out more between waterings. You can use a yellow sticky trap to help control the adult soil gnats. Mealybugs are pretty rare, but if they do attack your begonias, it’s best to treat them by hand rather than spraying anything on your begonias. Dipping a cotton swab in rubbing alcohol and using that to kill and remove the bugs works great. 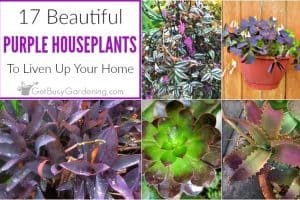 You won’t get rid of them all at once though, so make sure to check the plant often and keep treating it until there’s no sign of mealybugs. Learn how to get rid of houseplant bugs here. Begonias are wonderful, easy to grow houseplants that can bloom constantly. 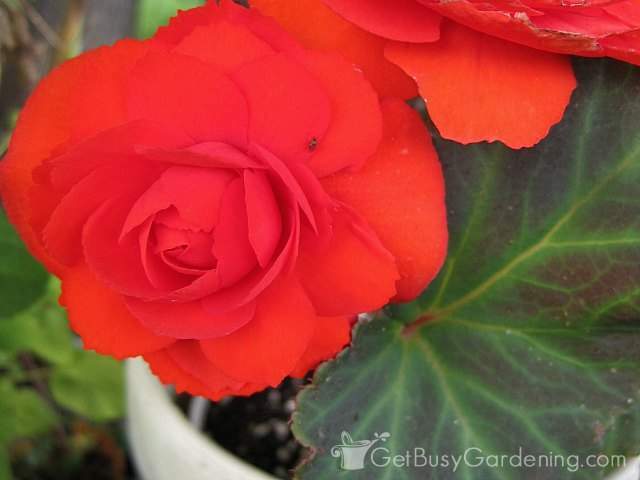 Growing begonias indoors is fun, and you can enjoy their beauty year round. 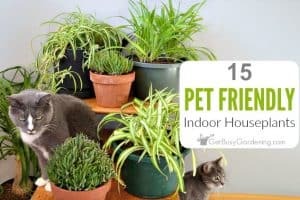 Plus it’s fun to collect different varieties of this tropical indoor plant, and they are all sure to add tons of color to your houseplant collection. If you follow these begonia plant care tips, your begonia houseplants will thrive for years to come. 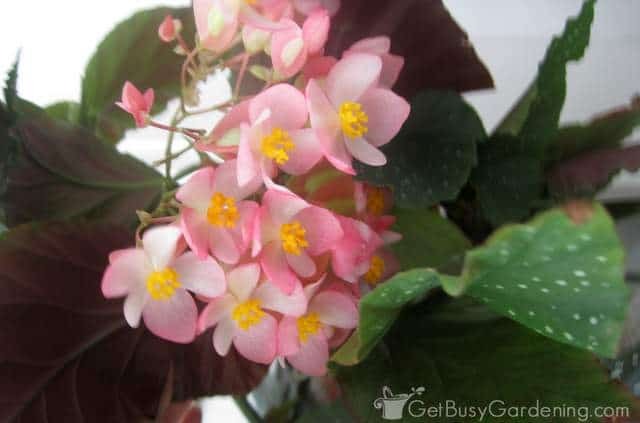 Do you grow begonia plants indoors? Share you begonia plant care tips in the comments below! My wife loves begonias. She was just reading that growing begonias indoors is one of the hot plant trends for 2017. Nice! Tell her to be careful, because it’s easy to get carried away when buying them. LOL! Can you give me more details about the plant? What do the leaves look like when they fall off? Do they turn black and mushy, are they dried a crispy, or are they spotty? Is the soil wet or dry? 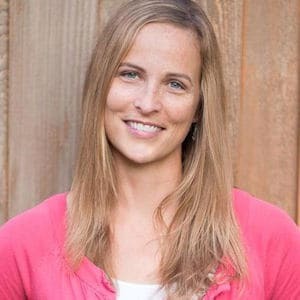 Are you fertilizing it, if so what type of fertilizer are you using (stop fertilizing until the plant is healthy again)? Also, what type of water are you using? Is it tap water, or other? Is the plant growing in a pot that has drainage holes? One other thing that comes to mind… take a close look at the leaves (especially the undersides of the leaves) and stems of the plant to check for bugs. Chemicals and salts in tap water can build up in the soil over time, and may be part of what’s causing problems with your begonia. I recommend using rainwater or distilled/filtered water on houseplants. (P.S. I’m not sure if you replied to my other questions. I don’t see a comment, sorry. This is the only comment that came through). Repotting can also cause leaf drop for some plants. Once it gets used to it’s new container and it’s new location, it should bounce back. Give it time. Thanks for this useful information about begonias . I searche searched the web because my begonia leaves are turning brown . I have learnt much from you ! I’m from Singapore and the weather is tropical hot and humid. Wonderful, you’re welcome! I’m glad you learned some good tips for caring for your begonia. Good luck, I hope it will thrive for you! Im not certain on when i should prune my begonia or what exactly to prune. What do leaves look like if they’re becoming unhealthy. I purchased my wax begonia about 2 weeks ago and repotted her in flower and vegetable soil. Her blooms were all shut the next morning, but with patience and some morning sun she’s not only opened just tis past Saturday, but also has new buds popping up, so I’m convinced she’s healthy. This is my first plant I’ve grown PERIOD. I water her a measured ratio of distilled water and blooming flower food. Her shelf allows her to get up to 6-8 hours of morning sun and indirect light through the afternoon, & I like to keep an airy house, so the door is often open or the temp in about 68-74°F. She’s potted in a terracotta pot with pebbles in the bottom to help with over watering, but I cant avoid her stems and leaves. How would I water her from the bottom? 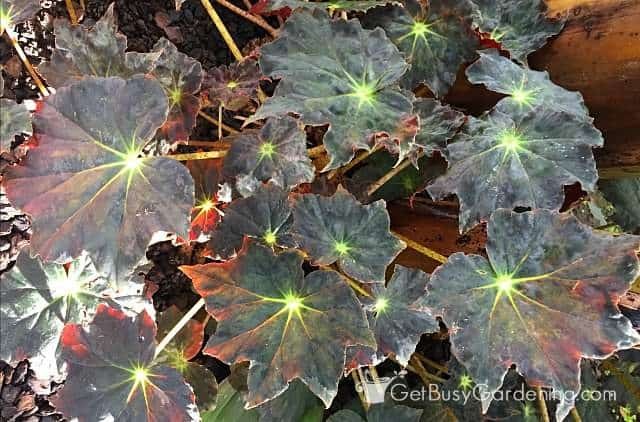 You don’t need to worry about pruning your begonia unless it starts to grow leggy and you want to keep a compact shape. When the flowers are done blooming, they usually fall from the plant, but you can pinch them out once they start to fade if you want. Unhealthy leaves would be yellow or brown. To bottom water your begonia plant, simply pour water into the plant tray, and allow the pot to soak it up from the bottom. If the plant tray is also made of terracotta, the water will leach through the terracotta and can cause damage to wood surfaces, so be sure to put a plastic plate or something underneath it if it’s sitting on a wooden shelf. Good luck! Yes. Some begonias will grow well in the sun, depending on the variety you have. They all like bright light. I bought a beautiful flowering begonia…still healthy and thriving but it has stopped flowering, how can I encourage more flowers ?TIA. 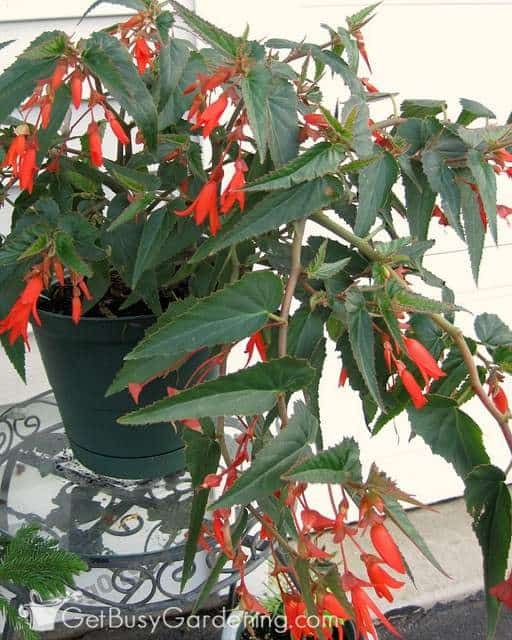 Fertilizing your begonia during the spring and summer months will encourage more flowers. If it’s pot bound, then potting it up in the spring will also help to encourage new growth and flowers. It sounds to me like your begonia might have mealybugs. Here’s how to get rid of them. How can you tell if the begonia is getting rootbound. Also do tuberous begonia have to go dormant if they are kept inside. A few signs that a plant is pot-bound are when the soil dries out really, really quickly, or if you see roots growing out the bottom of the pot or on top of the soil. You can also slide your begonia out of the pot to check. If there are more roots than soil, or if the roots are growing in circles around the bottom of the pot, then it’s pot-bound. Yes, tuberous begonias need a period of dormancy, and they will naturally go dormant in the fall/winter. But not all begonias have tubers. So, if your begonia doesn’t go dormant, then you probably don’t have a tuberous type.